Since 1958, Red’s Shoe Barn has been providing the folks in New England with the highest quality shoes at a great value and with legendary service. And those qualities are what help Red’s Shoe Barn remain successful today in the era of the impersonal, big-box stores. We genuinely care for our customers and work hard everyday to earn their business and their trust. When you walk through the doors of our Dover or Plaistow locations, you can be sure you’ll be greeted with a smile from associates that are eager to help. You’ll also have one of the largest selections of shoes in New England to shop from. Peter J. 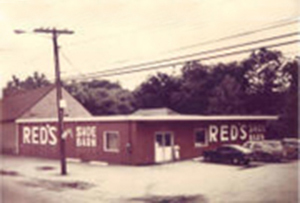 “Red” Murray starts Red’s Shoe Barn in a converted blacksmith’s shop in Dover, New Hampshire, buying shoes direct from the many local factories. In response to his growing business, Red decided to put on an addition to the original blacksmith’s shop. Red tears down the original building and addition to make room for a brand new building and more parking for his customers. With a growing loyal customer base, the Plaistow, New Hampshire location was built in 1983, opening the door for Massachusetts customers to buy shoes tax-free. Red’s Shoe Barn has always believed in giving back to the community, local kids, and their customers. That’s why Red’s has always supported local youth sports in Dover, even being part of the original founding board for Dover’s Pee Wee Football. Because of Red’s mission to help all kids play sports, even if they couldn’t afford to play, they consistently contribute to and sponsor Little League teams, as well as being a sponsor to the Dover Ice Arena. Then there’s the Red’s Annual Road Race for charity. 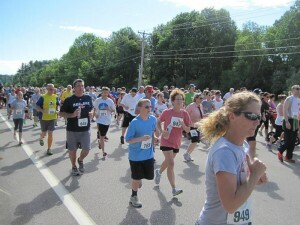 The 37th annual race had over 1,000 runners and walkers from all over New Hampshire, and was able to help out seven local charities. We do these things as a way of giving back to the communities and the people that have been our loyal customers over these last 60+ years—many of whom are also our neighbors and friends. It’s a small token of appreciation for supporting our business and providing a livelihood for our 100+ employees. As a small town business, we know better than most, that without you there would be no Red’s Shoe Barn. And for that we are eternally grateful.